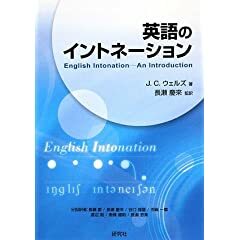 A few weeks ago a Japanese translation of my intonation book was published, under the title 英語の イントネーション. To be frank, the fact that you need a translation for this book, which is written in such clear, easy English, shows the (low) level of proficiency among Japanese teachers of English. I doubt if they ever need a knowledge of intonation when they cannot read the book in English! —which seems to me to be a fair comment. Japanese learners’ oral ability typically lags some way behind their reading ability. People whose English is not good enough to be able to read the book in the original English probably also can’t speak English well enough to need intonation. After all, intonation is pretty irrelevant for someone who can hardly string a sentence together with reasonable fluency. I suspect that the explanation is this: many Japanese learners know that their pronunciation is not very good, and feel embarrassed about this fact. So they willingly buy books about pronunciation (including intonation), in the hope that this will help them to improve. As an author, I obviously benefit from this line of thinking, because it helps the sales of my books. Some people might say, though, that they would do much better by listening to lots of spoken English and doing plenty of practice speaking the language themselves. Or they could painstakingly work through the English-language original. When I am learning a language I have sometimes talked to the cat, talked to the mirror, talked to myself, held imaginary conversations in my head, done mental simultaneous interpretation of a speech. It all helps. Reading books in your own language about the language you are learning may be interesting and increase your general knowledge, but it is not the best way to acquire conversational fluency. I found that reading books in other languages about my home city (written for tourists, but containing things I already knew) was quite helpful. @masggins: Masaki, I am obviously very grateful to you and your co-translators for all your hard work. Thank you! Everyone says you did a good job. @John Cowan: yes -- much more useful than reading books in your own language about foreign cities (which would be the equivalent). I think that, in general it is easier to read about any subject in one's native language than in a foreign language (with a few exceptions). I haven't read English Intonation unfortunately, but I would not be surprised to find at least some linguistic terminology or an academic writing style which a foreign speaker may find difficult to process, especially speaking a language so far removed from English as Japanese. I have a number of Japanese collegues (with whom I converse in English), and I find the ones with a decent intonation but less grasp of the English language to be better understandable than those with the reverse, although in general it is not their intonation but their pronunciation that is the largest obstacle. @masggins: Ah,... the "you" in my comment did not refer to Professor Wells. I used it in its "generic" meaning, I mean, "Japanese people in general". I may have been too colloquial. In any case, I am not saying that the book should not have been translated. On the contrary, even people with a good command of English will benefit from the translation because it takes less time to read it. I have always wanted to learn Chinese or Japanese. I really appreciate this post because it motivates me to consider learning another language. Thanks alot.